The 49ers’ high hopes for 2018 died early, when quarterback Jimmy Garoppolo was hurt and lost for the season in just the third game. Although there were several factors contributing to the 49ers’ fall to 4-12, Garoppolo’s loss was the biggest. 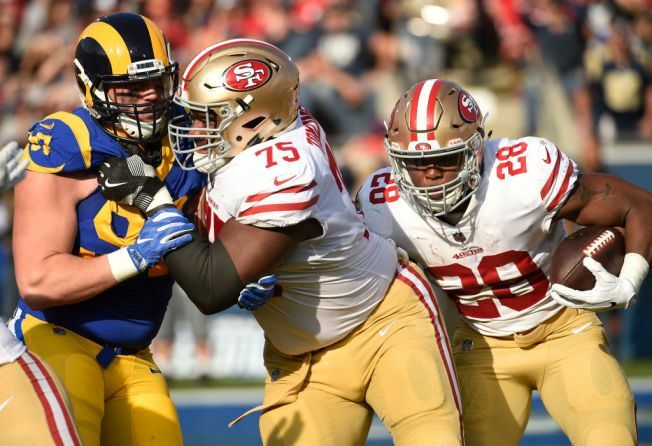 Now, with hope building again and Garoppolo expected to return at 100 percent in the 2019 season, it will be up to San Francisco’s offensive line to do a better job protecting Garoppolo (and the hopes of the franchise). Yet San Francisco’s offensive line was one of the NFL’s poorest units in pass protection last season. The five blockers up front will need to do a much better job in 2019. There is reason for optimism in that left tackle Joe Staley and No. 1 draft pick Mike McGlinchey were above average. Plus, center Weston Richburg will be healthy. In 2018, Richburg – in his first year with the 49ers after some strong seasons with the New York Giants – was injured early in the season and it impacted his ability to consistently pass protect. The weak spot was at guard, where opposing pass rushers were able to create pressure and disrupt San Francisco’s passing game. Recently, Mark Chichester of the analytic website Pro Football Focus, ranked the 49ers’ offensive line just 23rd in the NFL in pass-blocking efficiency as a unit. That must improve in 2019. Wrote Chichester: “Impressive performances from tackles Mike McGlinchey and Joe Staley did a great job of masking the underwhelming play of the interior. Mike Person and Laken Tomlinson combined to allow as many pressures (65) as their tackle duo did, while center Weston Richburg gave up the third-most pressures of any center in the league (33). It was believed early in the offseason that San Francisco might pursue a guard in free agency to shore up either the left or right spot, but the 49ers in March gave right guard Person, an NFL journeyman, a new three-year deal worth as much as $8.2 million. It’s still possible the 49ers draft a guard later this month to push Tomlinson and Person in 2019.